You may have noticed a powerful image making the rounds on social media in the run up to the recent election, and it provides a damning verdict on democracy in the UK. 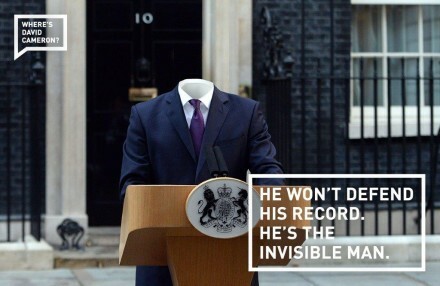 Nope, it’s not of Ed “Hell Yeah” Milibae in Angry Salmond’s pocket, or of a creepily invisible David Cameron making an address outside of Downing Street. It involves a bar chart and a giant hand. Powerful stuff. 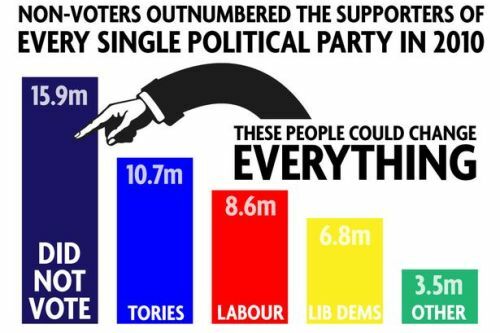 It’s a simple infographic showing that in 2010, ‘non-voters outnumbered the supporters of every single political party’ with ‘15.9 million people’ not turning out to vote compared to ‘10.7 million’ for the Conservatives, ‘8.6 million’ for Labour, and ‘6.8 million’ for the Liberal Democrats. Turnout in 2010 was less than two-thirds with 65.8% of registered voters turning out to vote. This year the election saw a whopping increase in turnout of 0.3 percentage points at 66.1%. That means that 15.7 million people (enough to fill Wembley Stadium more than 174 times) did not vote in 2015. There is a slight problem with the infographic though. It wasn’t 15.9 million non-voters in 2010; it was 15.6 million (internet, huh?). So, this means that this time, there was an actual increase in people not voting compared to 2010. That brings the average number of non-voters in the 21st century to 16.6 million. The average for the 20th century was 9.2 million. This is increasingly becoming a 21st century problem, and in my view, 2020 should see a 21st century solution. Online voting. Digital is king in modern Britain. In the UK today, 38 million people shop and socialise online, 28 million read the news online, and 27 million bank online. There are even 4.5 million dating online. At the same time, the UK is forecast to see a 20% reduction in the number of high street stores in the next 3 years, a reduction of 5.5 billion items sent in the postal market by 2023, and a newspaper market declining at a rate of more than 8% a year. These industries aren’t taking the change lying down; they are adapting to the internet age. The online retail share is expected to increase to 32% in 2018; the postal market has embraced online shopping with the parcels market expected to increase to 2.3 billion in 2023; and you would be hard-pressed to find a media outlet that doesn’t have a mobile, tablet, and PC platform. Democracy, however, has staunchly kept to its 19th century, paper-only, voting platform. If our voting system was on a stock exchange, traders would be desperately selling off shares like Gil Gunderson on speed. The 2015 General Election has seen the total number of non-voters increase for the first time in more than a decade. But why adapt an out-of-touch system to the modern world? A report I authored recently for WebRoots Democracy, found that in addition to boosting voter turnout to 79%, online voting could cut the cost-per-vote by a third and increase the accessibility of voting for those with vision-impairments and other disabilities. It could also result in a better-informed electorate and a significant reduction in the number of accidentally spoilt ballots. Did you know that in the recent election, an estimated 27,500 votes were rejected and not counted because voters ticked more than one candidate on their ballot papers? On top of that, at the current rate of 0.3 percentage point growth, it would take us over 200 years to reach 79% turnout. In the countless conversations I’ve had on this topic, those with reservations on the reform mention security, tradition, and combatting underlying causes. Security is certainly something that needs to be addressed, but this is a question that needs to be answered in the pilot phase, and it is my view that the picture is not as bleak as some claim. An example of progress on this issue can be found here in the UK, in Birmingham. Professors in the Computer Science department at the University of Birmingham recently claimed that they have made a ‘breakthrough’ in secure online voting, paving the way for online voting in 2020 or 2025. The tradition and atmosphere of voting at a polling station is something that should remain, and online voting should be introduced only as an additional option. However, personally, I found the experience of marking a piece of paper at a polling station slightly underwhelming. As to the underlying causes of political disengagement, there is undoubtedly more to be done, but this will ultimately be something that may be achieved over the long term, and if it is achieved, will carry no guarantee of sustainability. Sustainability is perhaps the most important reason to introduce online voting. Voter engagement has to be long-term and future-proof. Online voting will not achieve 100% turnout, but it will take us much closer to it than we are now. The argument for it this year was already strong, but it will be much stronger in five years time. Whilst you and I will have grown up in the pre-digital age of VCRs, audio cassettes, and encyclopaedias, the 2020 general election will be the first election where there will be a generation of first-time voters who have known nothing other than a lifestyle of digital accessibility. In 2020, we need to move past research, recommendations, and reports and actually see online voting become a reality. This blog is cross-posted on the Huffington Post and the London School of Economics ‘Constitution UK’ website.